ManageHub collaboration workspaces are a great way to manage client engagements, committee activities, strategic initiatives, or special interest groups. You can customize every workspace with its own logo. You can also, easily manage membership invitations and requests. Once set up you can monitor your group’s activity by simply reviewing built-in newsfeeds and link boxes. —Use Knowledge icon to contribute knowledge. —Use Icons to invite and manage your group’s members. —Use tabbed workspace sections to keep your collaboration organized. —Use Activity Feed to share ideas, documents, links, and important know-how. —Use the Link Boxes to provide your team with handy access to related projects, assignments, knowledgebase entries, attached documents, and external links. 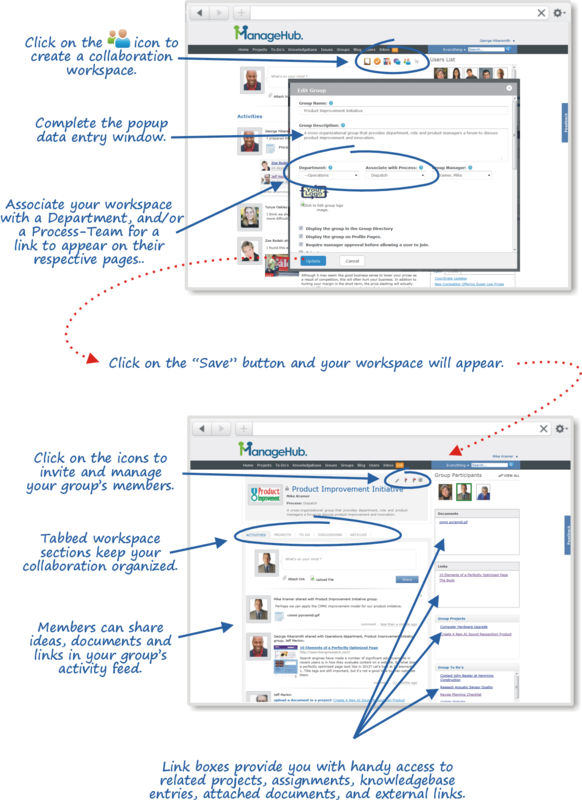 The ManageHub Collaboration Workspaces are a powerful tool that can be used to manage Special Interest Groups (SIGs), client engagements, cross department or cross organizational collaboration. Collaboration Workspaces can even be associated with a process team workspace, which is especially useful when the process team is responsible for managing the groups collaboration.